Always do proper homework before slamming someone on your blog. Else, it may sometime backfire. 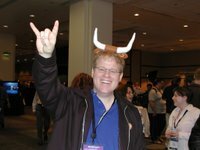 Scoble was very pissed off when he saw his blog content published on another website without giving him permission or proper credit. Scoble assumed that the website is owned by Elliott [another respectable blogger] since it had a line saying “software by Elliott Back". Following Scoble's post, Google suspended Elliot's account since they take copyright violations very seriously which is understandable. Elliott was more pissed that Scoble since he was loosing his blog revenue and earning a bad name for doing no crime. He made a phone call back to clarify things (do a whois) and Scoble did issue an apology note on his blog. Apparently, that splog was using a wordpress plugin written by Eliott giving Scoble an impression that the site itself is owned by Elliott. If anything, the lesson to be learned here is twofold: think and do your research before making severe moral or criminal accusations, and that the blogosphere A-list is too powerful. One person shouldn’t be able to bring down someone else’s revenue streams with a wave of their finger. Matt Craven has also discussed this episode in The Blog Herald Podcast - a recently launched technology podcast on news from around the blogosphere. It's one of my favorite shows now. Worth subscribing. Previous Reading: Dealing with Blog Plagiarism - What should you do when someone copies the content of your blog without permission or giving you any credit.